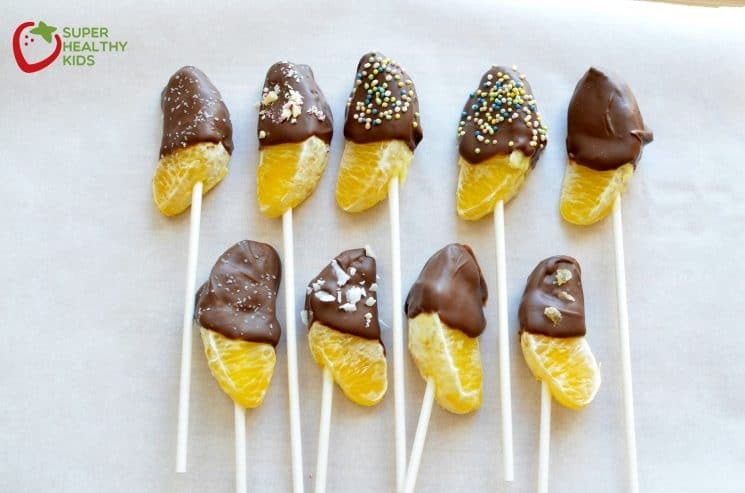 Kids Kitchen Activity: Chocolate Dipped Oranges! Living in Utah, our winter fruit choices have been limited. We generally eat a lot of apples, bananas, and oranges, but not much else. While it’s still possible to find other fruit, it usually doesn’t taste great, and the cost is outrageous. But we love apples, bananas and oranges, so we’re OK with overdoing it on those for a few months. We also like to make dessert! Whether it’s apple pie or banana ice cream, our sweet tooth is totally satisfied, while still keeping things healthy. 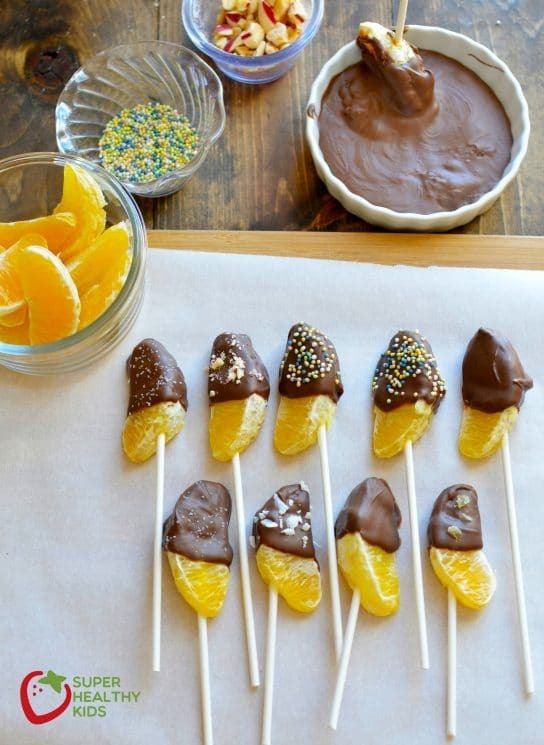 And since we probably won’t start dipping strawberries in chocolate until February, we took this opportunity to dip our oranges in chocolate instead. Taste great and most kids love them! So, we busted our our melting chocolates and got to work! Here’s what we did. Honestly, legit melting chocolate is ideal here, only because it melts easily and hardens quickly. However, we’ve also used some vegan brand chocolate chips, that also work OK. Sprinkles (of course!) We did find some that were dye free, and they’ve lasted us a very long time! Great investment! 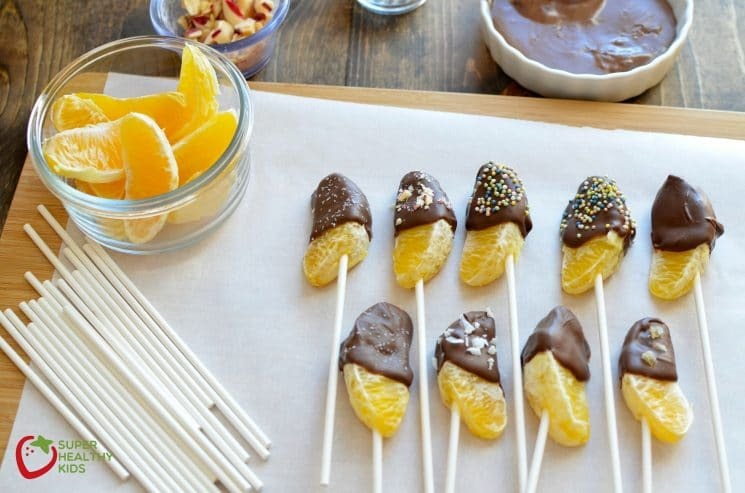 After we melted the chocolate, we skewered the oranges with a sucker stick, just to make it easier for them to handle. You can usually find these at the craft store in their candy making supplies. 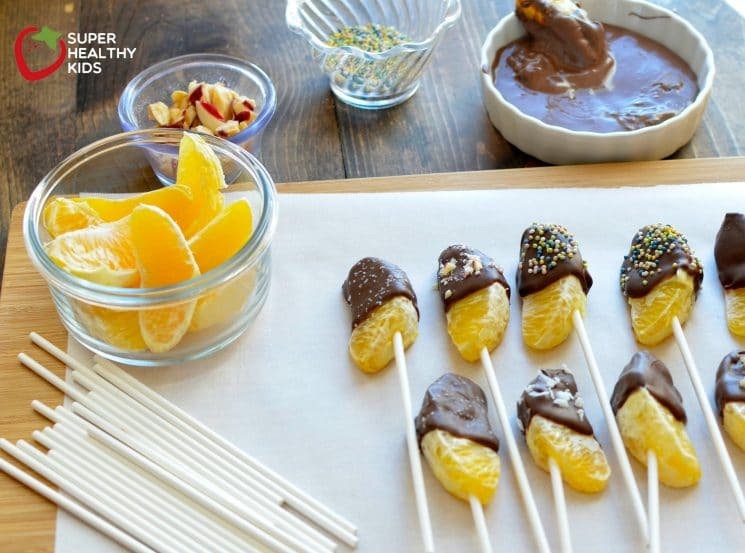 With the orange attached to your stick, let the kids dip in the melted chocolate. 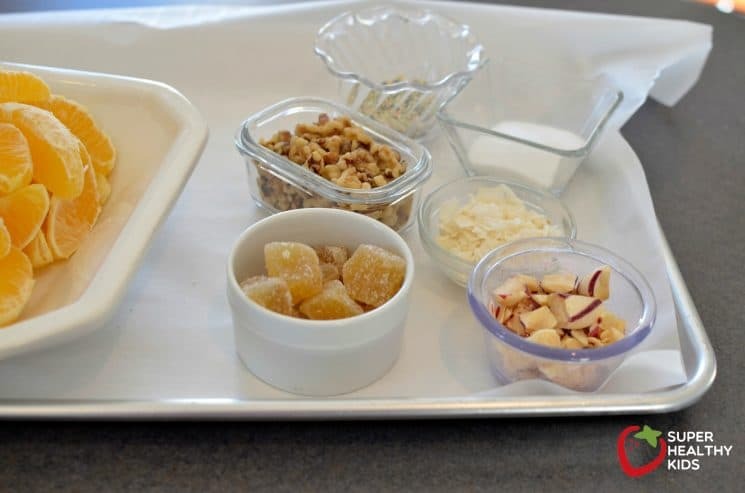 Before the chocolate hardens, lay them down on parchment paper on a cookie sheet. 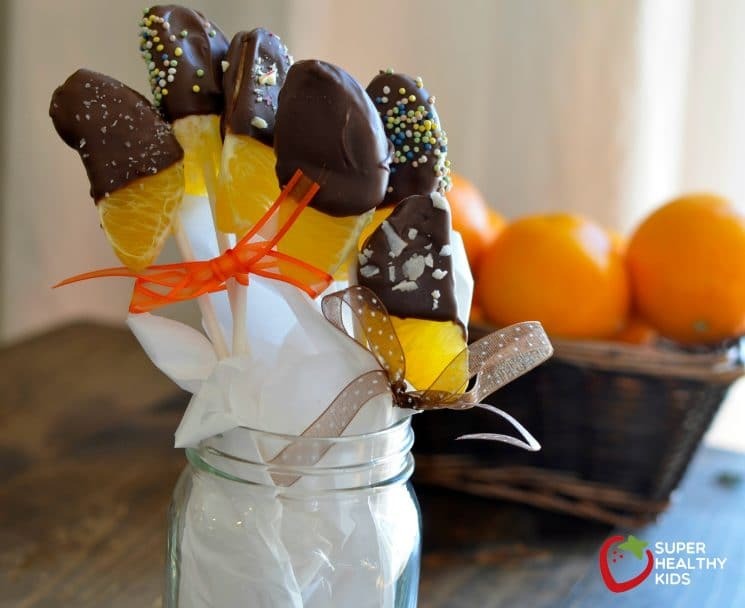 Then, the kids can sprinkle their toppings on any of the oranges they made, with a topping of their choice. Lastly, add the tray of chocolate treats to the fridge to harden the chocolate. 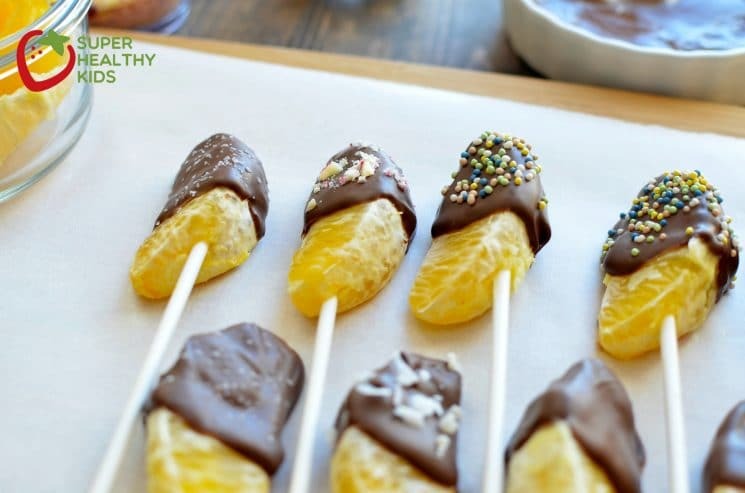 If you used real melting chocolates, this only takes a couple of minutes to harden up.